Mike Williams trained at Roehampton University, graduating in 2006. He has had a broad, eclectic performance career and has performed for several prestigious and emerging companies, independent artists, and theatre-makers such as Earthfall, FFIN DANCE, Exim Dance Company, Ransack Dance Company, JoonDance Company, Chisato Minamimura, Luke Pell with Candoco Dance Company, Melanda Dance, Sue Williams with DanceForms Productions and Jamie Flecther and Company with Contact Theatre. 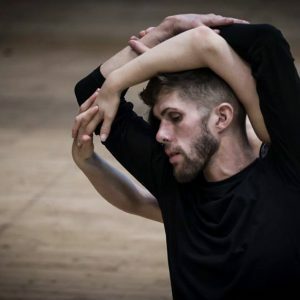 Mike’s work explores creating highly intricate, detailed and athletic choreography that pushes the body to its fullest capabilities and explores the beauty of the human body in its rawest form at a deeply personal level, honest and open to all. Most recently, Mike toured his acclaimed solo 4.33 to Guatemala. He also performed in the wonderful rich, quirky and endearing LGBTQ Cabaret musical, ‘Dancing Bear’, alongside Drag Queen Divina De Campo of BBCs All Together Now, and has made a return to further education to gain his PGCE at Coleg Sir Gar, Llanelli where he is currently teaching technique at BTEC level and leading the GCSE Dance Year Ones’. Mike looks forward to undertaking his Yoga Teacher Training in the summer.